To Cite: Fernandez-Cuadros M E, Perez-Moro O S, Albaladejo-Florin M J, Cabrera-Rodriguez L, Algarra-Lopez R, et al. Physical Examination of the Shoulder in the Rehabilitation Setting: A Review of the Literature, Middle East J Rehabil Health Stud. Online ahead of Print ; 6(1):e84347. doi: 10.5812/mejrh.84347. Shoulder pain (SP) is one of the most common complaints encountered in patients attending rehabilitation settings. Rotator cuff (RC) tendinopathies and subacromial impingement syndrome (SIS) are the most common disorders involved in SP. Physical examination (PE) is essential to perform the correct diagnosis and treatment. In fact, in the rehabilitation settings, patients are treated based on clinical symptoms and PE as well as clinical evolution. There are 184 maneuvers to evaluate the shoulder complex. PE is extremely important to evaluate the presence, location, and extent of RC tear or shoulder pathology. Unfortunately, PE is neither sensitive nor specific enough to diagnose a unique disorder. The current study aimed at reviewing the main features of clinical and physical evaluation and diagnostic accuracies of the most common PE tests performed in the rehabilitation settings. Shoulder pain (SP) is the commonest symptom that patients refer to when evaluated in rehabilitation settings (1-3). SP arises from pathologies that involve multiple articular tissue, and frequently various anatomical structures are usually affected (2). SP can be due to lesions such as rotator cuff (RC) tears, impingement syndrome, long head of biceps tendinopathy (LHBT) (3), edge instability, and superior migration (4). RC compresses the humeral head against the glenohumeral joint to strengthen rotational motion. Functionally, RC injuries may unbalance those rotational motion forces resulting in pain (4). In the case of RC tears, they show different tear sizes and tear locations, and they are usually associated with other shoulder pathology (4). Besides, from the clinical point of view, patients with SP and RC tears may present shoulders free of pain with normal function, or shoulders with severe pain and dysfunction (4). In SP, physical examination (PE) is essential to perform the correct diagnosis and treatment (4). In fact, rehabilitation specialists treat patients based on clinical symptoms and PE (5). There are specific maneuvers that might identify tear location and extension in painful shoulders. There are up to 184 maneuvers on the literature to diagnose SP (6); however, certain maneuvers were more accurate than the others (4). Nevertheless, up to 35% of patients are unable to fulfill clinical tests due to painful conditions, showing limited range of motion. Some of such patients with severe pain are unable to localize the origin of pain as it is extended to all over the shoulder. This is the main reason why PE is doubtful (3). Therefore, clinical tests are not sensitive and specific enough to diagnose shoulder tendinopathy due to concomitant intraarticular damage (3), since isolated tendinopathy is a very rare phenomenon (3). Indeed, several studies showed no correlation between clinical tests and arthroscopic findings. In such cases, imaging techniques such as ultrasound and magnetic resonance add accuracy to diagnosis (3). PE is quite important to evaluate RC tear location and extent. However, no PE is sensitive or specific enough to diagnose a unique disorder (2). Fortunately, the more the examination maneuvers are used, the better the diagnosis is achieved (4). The current study aimed at reviewing the main features of clinical and physical evaluation and diagnostic accuracies of the most common PE tests performed in the rehabilitation settings. The evaluation of SP is difficult due to the extent of possibilities of probable etiologies and the difficulty of physical hands-on examination of shoulder structures capable of causing pain (7). In rehabilitation settings, SP is one of the commonest observed complaints. The history and PE are basic to SP diagnoses, especially if more than one PE maneuver is used. Only if conservative managements fail, severe SP is suspected or doubtful diagnosis is observed, imaging techniques are then indicated (8). A complete anamnesis and PE are effective on shoulder complaints diagnosis. Pain and instability are very common. If pain is described as sharp or burning, radicular origin must be suspected; on the contrary, pain described as dull, diffuse, or aching might orientate towards tendonitis. Instability is usually related to a traumatic history or dislocation, but not always. Imaging techniques are helpful for progressive and accurate diagnosis. Even though SP is diagnosed without imaging techniques; the conservative treatment usually includes rest, ice packs, nonsteroidal anti-inflammatory drugs (NSAIDs), topical analgesics, intra-articular corticosteroids, and physical therapy (1). Whatever the case, a complete history and an exhaustive PE are vital for diagnosis (9). Important clues for shoulder evaluation should include age, laterality, basic complaint (pain, rigidity, and instability), onset (acute or chronic), mechanism of injury (traumatic or overuse), aggravating factors (lifting objects), related symptoms, previous surgeries, job (repetitive maneuvers), sports, workman’s compensation/litigation, and comorbidities (diabetes, gout) (9). Clinical SP evaluation starts by identifying the main complaints through anamnesis. Pain, weakness, stiffness, instability, and deformity should be asked for. Onset of symptoms and probable injury might orientate towards diagnosis. A radiological view should be ordered in case of trauma. Work, leisure activities, sports, hobbies, and factors related to pain should be investigated. A 65-year-old patient with night pain when lying on the affected shoulder might orientate RC tear. Patients with pain while abducting arms overhead at work may suggest subacromial impingement syndrome (SIS), mainly if pain appears at 60º - 120º range of motion (painful arc) (9). Pain originated by acromioclavicular (AC) joint is described as discomfort in lateral neck or lateral shoulder region. Long head of biceps tendon (LHBT) pain is mainly referred to anterior shoulder region. These descriptions are quite specific of pain origin. In the case of RC, pain location is not helpful to locate the site of tear. On the contrary, PE might locate tear size (10). PE is essential to evaluate patients with potential shoulder and RC pathology. The shoulder examination can define diagnosis after complete anamnesis. Since no physical test is pathognomonic of shoulder pathology, the combination of PE adds sensitivity and accuracy on diagnosis (4). PE of the shoulder requires skill and ability. PE should include inspection, palpation, shoulder movement evaluation, strength, stability, and provocative maneuvers (8, 9). Inspection (observation) helps to identify anatomical alterations such as atrophy, AC joint deformity, nerve palsy or traumatism. In older people, severe atrophy on supraspinatus and/or infraspinatus muscles might orientate towards RC tears (positive predictive value 81%) (Figure 1A) (8). Protraction of the scapula may denote a neurological lesion, producing winged scapula on examination (Figure 1B). Palpation of the tendon might detect a defect, especially if the evaluating finger anteriorly touches the acromion, as Codman described this sign (11). Range of motion (ROM) is an important component of PE. If performed bilaterally, the clinician may appreciate side-to-side differences (4). Pain between 60º and 120º arm abduction is suggestive of SIS; on the contrary, pain over 120º arm abduction might depict AC joint source (Figure 1C). A thorough history and a careful PE establish or suggest a specific diagnosis. A standardized evaluation including a variety of diagnostic tests and clinical assessments improve the accuracy on SP diagnosis (12). SP evaluation is a challenge for rehabilitation specialists, since PE maneuvers may be positive in more than one disorder of the shoulder. Physical evaluation may be able to locate periarticular lesions, but PE does not differentiate pathologies (13). Even though PE still plays a part to diagnose SP (2, 7). There is consensus among specialists about the accuracy and sensitivity to diagnose shoulder pathology (13, 14). Out of 184 known maneuvers to evaluate the shoulder, 10 are the most commonly used ones by specialists (6, 13). The Neer, Hawkins, and Yocum tests are used to diagnose SIS. Seven maneuvers are performed to locate tendon disorders: The Jobe test (supraspinatus), the Patte test (infraspinatus and teres minor), the Gerber lift-off test, and resisted internal rotation assessment (subscapularis), and the Yergason test, palm-up test, and the Popeye sign (biceps) (Figure 1D) (13). For this test, the physician is behind the patient and holds the scapula with one hand to avoid scapular rotation; then the physician raises patient’s arm with his/her other hand in an attempt to get both abduction and forward elevation. This reduces the space delimited by the greater tuberosity and anterior aspect of the acromion (2, 7, 13, 15). The maneuver is positive if pain is felt just prior to complete full flexion of the arm (7). The sensitivity of the maneuver varies from 64% to 81% and the specificity from 10% to 95% (Figure 2A and Table 1) (14). Figure 1. On examination of patient’s bare shoulder: A, atrophy of left supraspinatus and left infraspinatus muscles are clearly observed. This alteration may denote massive rotator cuff tear on the affected shoulder; B, protraction of the left scapula is observed, denoting possible nerve lesion on the affected side;C, on examination of the range of motion, pain elicited when the arms are abducted from 60º to 120º is suggestive of impingement syndrome; D, on the contrary, pain elicited when the arm is abducted further than 120º is suggestive of acromioclavicular pathology. A prominence in the distal arm is observed in both patients, denoting rupture of the biceps tendon. E, the patient on the left depicts acute rupture and ecchymosis is still observed; F, the patient on the right shows a chronic rupture of the tendon, delimited by the dots marked on the arm. For this test, the examiner is in front of the patient and flexes up the arm to 90º with an elbow bent of 90º; then the arm is gently rotated internally (2, 7, 13, 16). If pain occurs, then the test is positive (7). Sensitivity ranges from 46% to 87% and specificity from 26% to 89% (Figure 2B and Table 1) (14). Figure 2. A, the Neer test; examiner holds the scapula with one hand to prevent scapular rotation, and elevates patient’s arm while internally rotated. Pain after the maneuver denotes subacromial impingement. B, the Hawkins-Kennedy test; with the elbow flexed 90º and the arm abducted to 90º, produce an internal rotation of the forearm. Pain with this maneuver denotes subacromial impingement. For this test, the patient puts his/her hand on the contralateral shoulder and elevates the elbow without shoulder elevation (2, 7, 13, 17). Test is positive if patient feels pain during the maneuver (7). Sensitivity varies from 70% to 79% and specificity from 40% to 92% (Figure 3A and Table 1) (14). Figure 3. A, the Yocum test; with the hand in contralateral shoulder, elevate the elbow without raising the shoulder. Pain with this maneuver denotes subacromial impingement. B, the Jobe test (empty can test); abduct the shoulder to 90º and apply force downwards. Pain will denote supraspinatus tendonitis; incapability to resist force denotes supraspinatus tear. A positive test on Neer, Hawkins-Kennedy or Yocum maneuvers indicates SIS. For this test, the patient’s arms are abducted 90° and 30° horizontally in scapular plane. The arms are rotated downwards (thumbs pointing to the floor); the examiner pushes down the patient’s arms, and the patient tries to maintain his/her position (2, 7, 13, 18). The test sensitivity varies from 71% to 74% and its specificity from 30% to 74% (Figure 3B and Table 1) (14). For this test, the examiner holds the patient’s elbow in 90° of forward elevation and at the plane of the scapula. The patient rotates the arm laterally against examiner’s hand in order to evaluate the strength of lateral rotation (2, 7, 13, 19). Sensibility of the test varies from 36% to 71% and specificity from 60% to 95% (Figure 4A and Table 1) (14). Figure 4. A, the Patte test; incapability to resist external rotation with the arm abducted 90° and the elbow flexed denotes infraspinatus/teres minor tendonitis. B, the Gerber lift-off test; a patient that cannot separate the dorsum of the hand off the lower back after maximal internal rotation is diagnosed with subscapularis tear. In terms of the Jobe and Patte test, three possibilities are expected: (1) No pain, indicating that the tendon is unaffected; (2) resistance despite pain, denoting tendonitis; c) the incapability to resist with gradual descending of the arm, a sign of tendon rupture (2, 13, 19). For this purpose, with the hand placed at the back of the waist and the elbow flexed 90º and separated 5 - 10 cm from the back, the patient tries to maintain such posture and push examiners hand. The test is positive if the hand cannot be separated from the back, suggesting that the subscapularis tendon is ruptured (2, 7, 13, 20). The sensibility of the test is 6% - 68% and the specificity 23% - 90% (Figure 4B and Table 1) (14). For this purpose, pain elicited by resisted supination of the forearm in the location of biceps tendon denotes bicipital tendonitis. Using this test, elbow flexion plus resisted medial rotation is simultaneously performed. Subluxation of tendon at bicipital groove may elicit abnormal sensation (2). Sensitivity ranges from 14% to 75% and specificity of the test from 70% to 89% (Figure 5A and Table 1) (14). Figure 5. A, the Yergason test; pain caused on the bicipital groove after resisted pronation of the forearm with the elbow flexed denotes bicipital tendonitis. B, Palm-up test; pain elicited at the anterior aspect of the shoulder after resisted elevation of the arm with the elbow extended and the palm supinated denotes bicipital tendonitis. In this regard, the patient elevates the extended arm, with the palm facing upwards and against examiner’s resistance; pain along LHBT denotes tendonitis (Figure 5B and Table 1) (13, 21). It shows a bulk in the distal arm due to retraction of the biceps in the belly muscle, indicating biceps tendon rupture (13, 22). Usually, this sign is observed early at inspection while performing clinical evaluation and prior to PE (Figure 1D and Table 1). The shoulder is the most complex joint of the body reflected by the number of tests and maneuvers that are described to evaluate the shoulder complaints (23). The current review study described 10 out of 184 tests believed to be the most useful ones to evaluate SP in the rehabilitation settings and in accordance with the statements by Ganestam et al. (6). To perform an accurate and updated diagnosis, a systematic approach to history and PE should be accomplished (23). Therefore, a thorough history begins with a complete clinical evaluation of the shoulder that narrows the differential diagnosis and serves as a guide to the physical evaluation (23). SP is the most common condition observed in the rehabilitation settings (1). SP syndrome usually involves several periarticular structures such as RC, the biceps tendon, and the subacromial subdeltoid (SASD) bursa (13). The most common lesions that produce SP are RC tendonitis, biceps tendonitis, and SASD bursitis (13). Unfortunately, on SP, more than one of these conditions usually coexist, making diagnosis a very difficult task (1, 3, 24). Risk factors to present SP include age, trauma, and overuse (4). This would explain why SP with ultrasound-diagnosed disorders is more common in young people; on the contrary, full-thickness tears of the RC are more common in people over 65 years old. Dynamic pathology originates shoulder complaints; being SIS the initial state and RC tear the final stage (1). In simple words, tendon lesions related to overuse (secondary to work or sports) are common in young people, while degeneration is due to aging (1) and it is very frequent in older people (7). Then, tendon degeneration occurs as a part of the aging process, repetitive trauma or both (13). Neer described SIS as the pain secondary to arm elevation after scapular stabilization, felt on the deltoid aerea (25). This maneuver compresses the supraspinatus tendon between the acromion and the humeral head (7). Neer classified the impingement syndrome in three stages ranging from stage I (RC tendonitis common in younger patients) to stage III (tendon rupture common in older patients) (25). From the most recent up-to-date meta-analysis performed by Hegedus et al. (14), it is observed that no single shoulder PE test can make a pathognomonic diagnosis. On the contrary, the combination of shoulder PE tests provides better accuracy on SP diagnosis. Fowler et al. (26), stated that an accuracy in recreational athletes based on isolated shoulder tests was very low. Combination of tests substantially increased the sensitivity in all pathological conditions. Pain caused by compression of the RC at the acromial arch can be diagnosed as RC lesion, but it is not specific. It could be indicative of tendinitis, partial and/or total tear lesion (13). Fodor et al. (27), stated that the Hawkins-Kennedy test was the most sensitive maneuver to identify SIS, while the Neer was the most specific. With four positive test results (the Neer, the Yocum, the Hawkins-Kennedy, and painful arc), the specificity improves, but the sensitivity does not. SIS stages are difficult to diagnose just by physical tests. Silva et al. (7), reported that the Yocum test showed the best sensitivity and accuracy to diagnose SIS. In the same study, the Gerber test was the most useful one to diagnose subacromial subdeltoid bursitis; and, if combined to Patte test, the accuracy even increased (7). Chew et al. (28), stated that the diagnosis of supraspinatus pathology improved if these tests were used in combination: (1) Patients older than 39 years, (2) a positive painful arc test, and (3) self-reported clicking or popping. To evaluate RC tendons, Goyal et al. (29), stated that PE sensitivity was good for supraspinatus and low for acromioclavicular joint and infraspinatus. Specificity was high for infraspinatus, subscapularis, and AC joint lesions. Moreover, PE does not discriminate RC tendonitis from tear, whether partial-thickness or full-thickness. In the case of LHBT, as Gill stated, no single PE test can accurately predict the presence of a partial tear, whether by palpation, lift-off test, or the Speed test (30). According to the previous observations it can be inferred that accuracy of clinical SP diagnosis is very poor. Overall, physical tests have limited diagnostic value. In the case of SIS, although the Hawkins-Kennedy test might rule out SIS when negative, SIS includes several pathologies; to date, bursitis, tendonitis, and RC tears (31). Therefore, the label of SIS may not help to guide treatment (32). To diagnose SP pathology by the employment of clinical signs and symptoms, Norwood et al. (33), tried to define if they might establish RC tear and/or severity. For SP diagnosis, they stated that pain and location were not helpful at all. Shoulder pain is one of the most common complaints observed in rehabilitation settings. A thorough history and a PE are of paramount importance for accurate decision making about the nature of the injury and the adequate treatment. Clinical tests used to diagnose shoulder pain can locate the lesion, but not differentiate between clinical entities. No clinical test is pathognomonic of any underlying condition. The combination of PEs adds accuracy to the diagnosis of shoulder pathology. The most common tests used by rehabilitation specialists for the PE of the shoulder such as Neer, Hawkins-Kennedy, Yocum, Jobe, Patte, Gerber, Yergasson, and palm-up as well as Popeye sign were presented in the current review study. Authors' Contribution: Marcos Edgar Fernandez-Cuadros: study design, translation of the manuscript, physical examinations, and taking pictures; Olga Susana Perez-Moro, Maria Jesus Albaladejo-Florin, Luz Otilia Casique-Bocanegra, and Ruben Algarra-Lopez: revision and submitting the manuscript; Laura Cabrera-Rodriguez: translation of the manuscript and taking pictures. Ethical Considerations: Authors and patients firmed consent to publish picyures presented on this review article. One of the authors is also a model who performed the physical examination of pictures. Funding/Support: The study did not receive any funding/ financial support. 1. Fernández-Cuadros ME, Albaladejo-Florín MJ, Cabrera-Rodríguez L. Shoulder pain in rehabilitation setting: From a standardized ultrasound protocol evaluation to specific subacromial disorders. MOJ Orthop Rheumatol. 2018;10(4):358-64. 2. Kim HA, Kim SH, Seo YI. Ultrasonographic findings of painful shoulders and correlation between physical examination and ultrasonographic rotator cuff tear. Mod Rheumatol. 2007;17(3):213-9. doi: 10.1007/s10165-007-0577-8. [PubMed: 17564776]. 3. Zabrzyński J, Szumlański A. Tendinopathy of the long head of the biceps tendon – physical examination confronted with shoulder arthroscopy findings. Med Biol Sci. 2016;30(2):67. doi: 10.12775/mbs.2016.008. 4. Moulton SG, Greenspoon JA, Millett PJ, Petri M. Risk factors, pathobiomechanics and physical examination of rotator cuff tears. Open Orthop J. 2016;10:277-85. doi: 10.2174/1874325001610010277. [PubMed: 27708731]. [PubMed Central: PMC5039902]. 5. Fernandez-Cuadros ME, Susana Perez-Moro O, Jesus Albaladejo-Florin M, Ramos-Gonzalez C, Cabrera-Rodriguez L, Algarra-Lopez R. Utility of ultrasound on musculoskeletal pathology in hands of a rehabilitation specialist: A review of the literature. Middle East J Rehabil Health Stud. 2018;5(1). doi: 10.5812/mejrh.65931. 6. Ganestam A, Attrup ML, Hølmich P, Barfod KW. ’Evaluation of clinical practice of shoulder examination amon ten experienced shoulder surgeons'. J Orthop Res Physiother. 2015. 7. Silva L, Andreu JL, Munoz P, Pastrana M, Millan I, Sanz J, et al. Accuracy of physical examination in subacromial impingement syndrome. Rheumatology (Oxford). 2008;47(5):679-83. doi: 10.1093/rheumatology/ken101. [PubMed: 18375403]. 8. Stevenson JH, Trojian T. Evaluation of shoulder pain. J Fam Pract. 2002;51(7):605-11. [PubMed: 12160496]. 9. Holmes RE, Barfield WR, Woolf SK. Clinical evaluation of nonarthritic shoulder pain: Diagnosis and treatment. Phys Sportsmed. 2015;43(3):262-8. doi: 10.1080/00913847.2015.1005542. [PubMed: 25622930]. 10. Itoi E, Minagawa H, Yamamoto N, Seki N, Abe H. Are pain location and physical examinations useful in locating a tear site of the rotator cuff? Am J Sports Med. 2006;34(2):256-64. doi: 10.1177/0363546505280430. [PubMed: 16219939]. 11. Itoi E. Rotator cuff tear: Physical examination and conservative treatment. J Orthop Sci. 2013;18(2):197-204. doi: 10.1007/s00776-012-0345-2. [PubMed: 23306597]. [PubMed Central: PMC3607722]. 12. Kim KC, Rhee KJ, Shin HD, Byun KY. Physical examinations of rotator cuff tear. J Korean Shoulder Elbow Soc. 2008;11(1):13-8. doi: 10.5397/CiSE.2008.11.1.013. 13. Naredo E, Aguado P, De Miguel E, Uson J, Mayordomo L, Gijon-Banos J, et al. Painful shoulder: Comparison of physical examination and ultrasonographic findings. Ann Rheum Dis. 2002;61(2):132-6. [PubMed: 11796399]. [PubMed Central: PMC1754006]. 14. Hegedus EJ, Goode AP, Cook CE, Michener L, Myer CA, Myer DM, et al. Which physical examination tests provide clinicians with the most value when examining the shoulder? Update of a systematic review with meta-analysis of individual tests. Br J Sports Med. 2012;46(14):964-78. doi: 10.1136/bjsports-2012-091066. [PubMed: 22773322]. 15. Neer CS 2nd, Welsh RP. The shoulder in sports. Orthop Clin North Am. 1977;8(3):583-91. [PubMed: 329174]. 16. Hawkins RJ, Kennedy JC. Impingement syndrome in athletes. Am J Sports Med. 1980;8(3):151-8. doi: 10.1177/036354658000800302. [PubMed: 7377445]. 17. Yocum LA. Assessing the shoulder. History, physical examination, differential diagnosis, and special tests used. Clin Sports Med. 1983;2(2):281-9. [PubMed: 9697638]. 18. Jobe FW, Jobe CM. Painful athletic injuries of the shoulder. Clin Orthop Relat Res. 1983;(173):117-24. [PubMed: 6825323]. 19. Leroux JL, Thomas E, Bonnel F, Blotman F. Diagnostic value of clinical tests for shoulder impingement syndrome. Rev Rhum Engl Ed. 1995;62(6):423-8. [PubMed: 7552206]. 20. Gerber C, Krushell RJ. Isolated rupture of the tendon of the subscapularis muscle. Clinical features in 16 cases. J Bone Joint Surg Br. 1991;73(3):389-94. [PubMed: 1670434]. 21. Gilcreest EL. 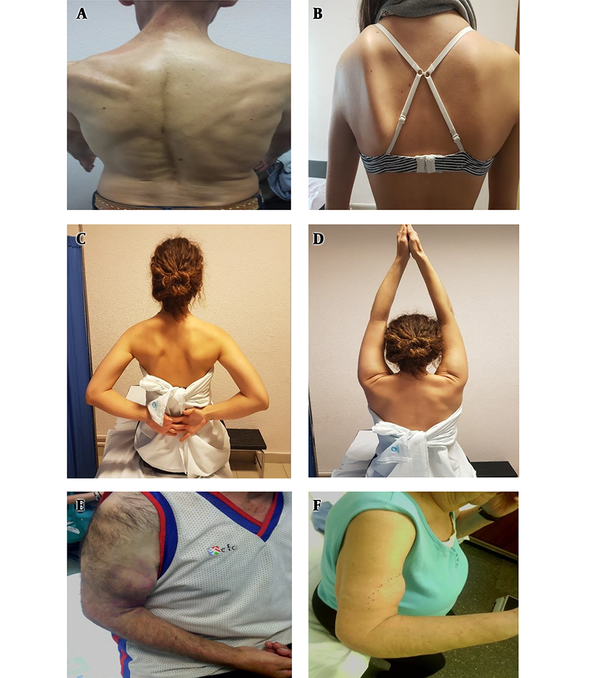 Dislocation and elongation of the long head of the biceps brachii: An analysis of six cases. Ann Surg. 1936;104(1):118-38. [PubMed: 17856798]. [PubMed Central: PMC1390338]. 22. Sheon RP, Moskowitz RW, Goldberg VM. Upper limb disorders. Soft tissue rheumatic pain. Baltimore: Williams and Wilkins; 1987. p. 79-129. 23. Baker CL, Merkley MS. Clinical evaluation of the athlete's shoulder. J Athl Train. 2000;35(3):256-60. [PubMed: 16558637]. [PubMed Central: PMC1323386]. 24. Ottenheijm RP, van't Klooster IG, Starmans LM, Vanderdood K, de Bie RA, Dinant GJ, et al. Ultrasound-diagnosed disorders in shoulder patients in daily general practice: A retrospective observational study. BMC Fam Pract. 2014;15:115. doi: 10.1186/1471-2296-15-115. [PubMed: 24916105]. [PubMed Central: PMC4057656]. 25. Neer CS 2nd. Anterior acromioplasty for the chronic impingement syndrome in the shoulder: A preliminary report. J Bone Joint Surg Am. 1972;54(1):41-50. [PubMed: 5054450]. 26. Fowler EM, Horsley IG, Rolf CG. Clinical and arthroscopic findings in recreationally active patients. Sports Med Arthrosc Rehabil Ther Technol. 2010;2:2. doi: 10.1186/1758-2555-2-2. [PubMed: 20157421]. [PubMed Central: PMC2821297]. 27. Fodor D, Poanta L, Felea I, Rednic S, Bolosiu H. Shoulder impingement syndrome: Correlations between clinical tests and ultrasonographic findings. Ortop Traumatol Rehabil. 2009;11(2):120-6. [PubMed: 19502669]. 28. Chew K, Pua YH, Chin J, Clarke M, Wong YS. Clinical predictors for the diagnosis of supraspinatus pathology. Physiother Singapore. 2010;13(2):12-7. 29. Goyal P, Hemal U, Kumar R. High resolution sonographic evaluation of painful shoulder. Int J Radiol. 2010;12:22. 30. Gill HS, El Rassi G, Bahk MS, Castillo RC, McFarland EG. Physical examination for partial tears of the biceps tendon. Am J Sports Med. 2007;35(8):1334-40. doi: 10.1177/0363546507300058. [PubMed: 17369556]. 31. Harrison AK, Flatow EL. Subacromial impingement syndrome. Am Acad Orthop Surgeon. 2011;19(11):701-8. doi: 10.5435/00124635-201111000-00006. 32. Dorrestijn O, Stevens M, Winters JC, van der Meer K, Diercks RL. Conservative or surgical treatment for subacromial impingement syndrome? A systematic review. J Shoulder Elbow Surg. 2009;18(4):652-60. doi: 10.1016/j.jse.2009.01.010. [PubMed: 19286397]. 33. Norwood LA, Barrack R, Jacobson KE. Clinical presentation of complete tears of the rotator cuff. J Bone Joint Surg Am. 1989;71(4):499-505. [PubMed: 2703509].